The MPA Annual General Meeting will take place at Hall Two, Kings Place in Kings Cross on Tuesday 3rd July from 2.45 pm to 5.15pm. This year’s AGM theme is ‘Deeds Not Words’, a phrase coined by the suffragettes. We’ve chosen this theme not only because it’s their 100 year anniversary, but also because we want to champion those men and women from across the music industry who’ve gone the extra mile to get stuff done! Following the formal business presented by Jane Dyball (CEO, MPA Group of Companies) and Jackie Alway (Chair, MPA), there will be a presentation and panel discussion putting the spotlight on and hearing from those who have gone above and beyond to make a difference in their industry. The panel will be chaired by Catherine Mayer, journalist, activist, former Editor of TIME magazine and the co-founder and President of the Women’s Equality Party. Further speakers will be announced in due course. 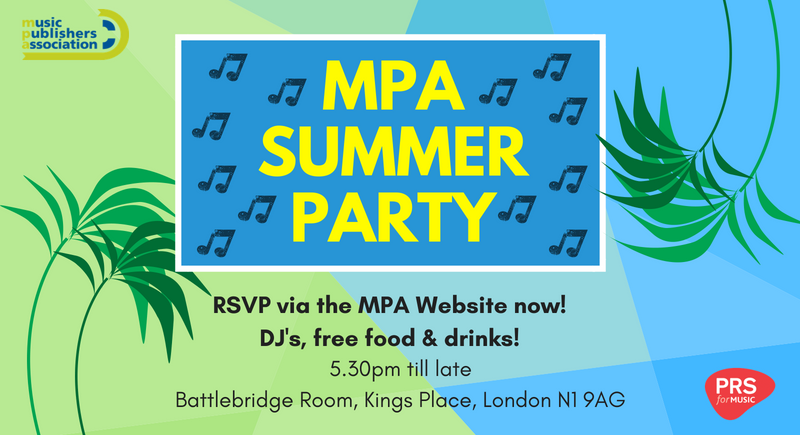 Following the MPA AGM, our second ever MPA Summer Party will take place on Tuesday 3rd July at the amazing canal side venue, the Battlebridge in Kings Place, Kings Cross from 5.30 pm. You can RSVP below and for more information please click here. Please note to RSVP you need to have your log-in details, please contact ashling.pickett@mpagroup.com if you do not have them yet or need a new password.